The Independent National Electoral Commission (INEC) on Wednesday said 409,813 Internally Displaced Persons (IDPs) from eight local government areas of Borno State would be casting their votes in camps within and outside Maiduguri, the state capital. The REC made this known at an interactive session organised by the Nigeria Union of Journalists (NUJ) for election officials, civil society organisations, political parties, and journalists. The federal government and the leadership of the Academic Staff Union of Universities will hold a reconciliatory meeting on Thursday in an effort to resolve issues that led to the ongoing strike called by ASUU. 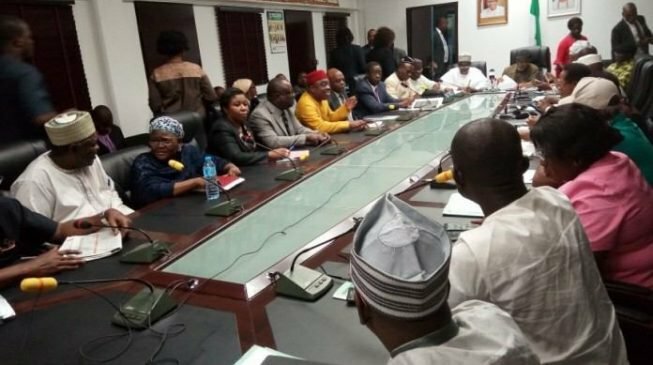 ASUU president, Prof Biodun Ogunyemi, said at the end of the last meeting held at the Ministry of Labour and Employment that there was an agreement to adjourn until Thursday after the leadership of the ASUU must have met other members to discuss the new government position of its demands. Mohammed Momoh, Lagos State Coordinator, National Youth Service Corps (NYSC), on Wednesday said that the scheme had mobilised 13,637 corps members as INEC ad hoc staff for the 2019 general election. Momoh made the disclosure while addressing corps members at the Ikeja Local Government Secretariat ahead of their participation in the 2019 general elections. Nigeria’s main opposition, the Peoples Democratic Party (PDP), has threatened to pull out of the peace accord signed by the party and its presidential candidate, Atiku Abubakar ahead of the general elections. The party made this known via a statement by its national publicity secretary, Kola Ologbondiyan, on Tuesday, in Abuja.